Sunfield UB hired two persons to care for their youth ministry. Dennis Weber will work with junior high students, and Raquel Brace will work with senior high students. Also, Roy Atherton joined the staff as Assistant Pastor. He is from Portland, Mich.
Shannon Colwin, formerly the youth pastor at Good Shepherd Church in Huntington, has resigned that position as of July 13, 2003. He is serving in another denomination. Jennifer Barlow resigned as Youth Pastor at First UB (Columbus, Ohio) as of July 31. This month Rev. Bobby Blaine celebrates his 60th year of ministry. He took his first church the same week that he and Virginia were married…which means they are also celebrating their 60th wedding anniversary. Rev. Blaine is a retired minister in Central Conference, and the former longtime pastor of what is now Good Shepherd UB in Greenfield, Ohio. Jim Sturgeon and his wife Joanne, having retired August 31 from the pastorate of Decatur UB (Decatur, Ind. ), have moved to Rockford, Ohio. It has been learned that William M. Wood, a retired minister in Central Conference, passed away in June. Nathan Garret has been hired as youth pastor at New Horizons UB (Rockford, Ohio) effective October 10. He was most recently youth director at Shadyrest Bible Church in Chesterfield, N. J.
Ben and Lisa Geiser are the parents of a baby girl, Monica Ann. Ben is associate pastor at Christ Fellowship (Westerville, Ohio). Eighteen people from Anchor UB (Fort Wayne, Ind.) attended the Prevailing Church Conference at Willow Creek Community Church in the Chicago area October 22-24. On October 13, the UB Executive Leadership Team and the conference superintendents held a special meeting in Huntington, Ind., to consider options for the future of the United Brethren church. A special study committee, having studied several options, recommended that we pursue joining with the Missionary Church, an evangelical denomination based in Fort Wayne, Ind. After meeting with the superintendents on October 13, the ELT voted unanimously to pursue joining with the Missionary Church. This set into motion a two-year process which will require affirmation by the US National Board in April 2004, a positive vote in a referendum by the UB constituency in October 2004, and a two-thirds vote by the US National Conference in June 2005. Only the US National Conference can make the official final decision. Much discussion about this is occurring online on the UB Discussion Board. Various resources will be posted here. “‘Splash!’ Children’s Ministry opened shop September 7 with two sessions meeting simultaneously with the 9:45 a.m. and 11:15 a.m. worship services for K-6 students. The structure follows the Promiseland model at Willow Creek Community Church. On September 21, Dewitt UB (Dewitt, Mich.) celebrated ten years of ministry with Superintendent Dave Burkett and founding pastor Mike Arnold in attendance. On October 12, Sunfield UB will dedicate a new 82-by-60 foot building addition, which will provide a fellowship area and more Sunday school classrooms. The building was begun a year ago. Former pastors and members will take part in the service. Mark Ralph is the current pastor. 06 Oct Lots of News from Mason, Mich.
Annette Haines of Eden UB (Mason, Mich.) sent the following news items. “Angela Oesterle returned at the end of June from working as a volunteer in the library of Jamaica Bible College. She helped catalog hundreds of books to be shelved in their new building. She also taught as a substitute in the college and worked with Jamaicans in Bible studies and Sunday school. She was stretched physically and spiritually from the challenge of working in a different culture. She had previously gone twice with a group from Eden Church for two-week missions trip, and she knew the Lord wanted her to give more time to Jamaica. Angela plans to return to Jamaica when several details are worked out, such as further education and finances. “In August, we held VBS with the theme “Crown Him King.” This was for the whole family. Margaret Maybee, our music director, and her husband, Milan, one of our former pastors, organized the program. Wanting someone to minister to parents who is still raising children, they brought in Valerie Reynolds, the associate pastor at Mt. Hope UB church in Carson City, Mich. She talked about why God sends tests into our lives and how to handle them. “While Valerie talked to the adults with young children, the older adults conducted the class time for the children. A staff person from the Lansing Campus Life chapter talked to the teens about learning to be like Christ in four specific areas. “The missions project was to raise money to buy shelves for the Jamaica Bible College library. Over $800 was raised in five nights for this project. On the last night, 3-4 tornadoes touched down near the church, causing some unexpected excitement! The Lord protected Eden; no one was hurt and no property was damaged, although there was a lot of damage near the church. “Phase 2 of a three-part building project has begun. Phase 1 was the completion of a new parking lot, because a Family Life Center is being built where the old parking lot was, behind the church. The Family Life Center, which will cover almost 22,000 square feet and cost $2.2 million (including the new parking lot), was begun by a ground-breaking ceremony on September 7. In this ceremony, six men who are church leaders, including the three pastors, turned over a shovelful of dirt. Then they each handed their shovel to a child, who then turned the next shovelful. This was a symbolic means of showing that Eden belongs to the present and to the future. 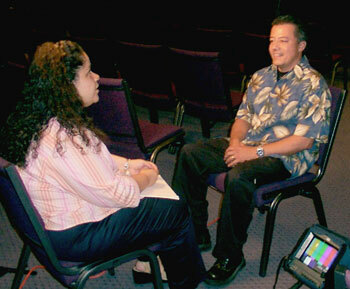 Ron Gonzales, pastor of Open Bible Fellowship, being interested by the ABC crew. Sorting clothes in Angels Closet. One of the Johnston daughters at work in Angels Closet. On September 29, a family from Open Bible Fellowship (Safford, Ariz.) was featured on ABC’s Good Morning America. Bill and Ruth Johnston started a clothing ministry when the local clothing bank closed. They feared that needy family would go unhelped, and their daughters would come home from school reporting about classmates who needed clothes. So they decided to do something about it. The result was Angels Closet. 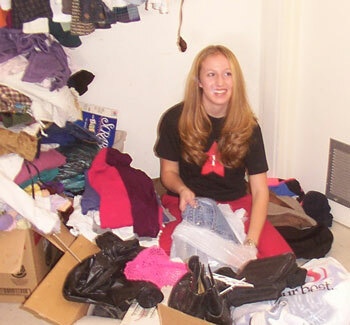 They began by storing donated clothes in their garage, giving them out to individual families. They soon expanded into a 10-by-10 foot room behind the church, and then it took over two rooms in the church educational building. An article about the Johnston family can be found on ABC’s website. Angels Closet also has its own website. Bobbie Thompson also wrote about other recent goings on at Open Bible Fellowship. “Over 150 kids attended each day of our summer Vacation Bible School. There were 33 decisions for Christ and several rededications. “A team from the church goes into Mexico every other month to distribute food and clothing, and to preach the gospel. Last count, souls saved to date was over 900. “Sunday school is going strong, and our worship ministry just added three new members to their team, which now gives us a total of 10 members. Things are going great. With the new facilities we have had plenty of room for everyone. “Right now, we are getting ready for our Family Fun Night, an alternative to Halloween. Last year, over 1200 people come through our doors. There will be several games with prizes, a concession stand, and a concert held outside during the evening. Don Palmer concluded his ministry as pastor of Pennfield UB (Battle Creek, Mich.) on September 30. A supply pastor is being secured. Angela Burnside is the new Director of Children’s Ministries at Gaines UB (Caledonia, Mich.), as of September 3. She succeeds Kelly Dutcher, who concluded her tenure in that position on August 15. Marion Hall, as of August 17, is the new pastor of Harrison UB (Harrison , Mich.). Brian Biedenbach is the new Associate Pastor of Student Ministries at Emmanuel UB (Fort Wayne, Ind. ), as of September 28. This is a fulltime position. He replaces Rudy Tamez, who accepted a position with a church in another denomination. The Woodbury UB church (Woodbury, Mich.) voted to close, as of October 31.